Let’s start out our week with some inspirational soap….Facebook Photo of the Week time. As always, there have been some incredible bath and body product photos that each and every one of you are creating (and posting to our Facebook page). We have such an active soapmaking community and I’m grateful for all of you that continue to participate and make it a better place for all soapers. Are you ready for the winner? Let’s go! This week’s photo comes to us from Andrea of Soaps4Squares. 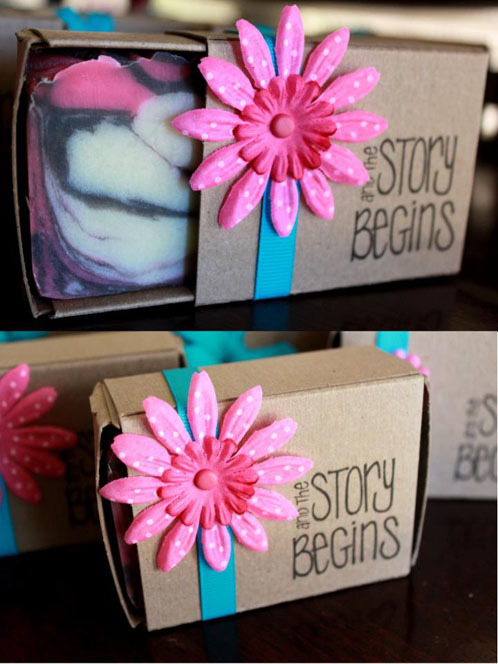 Andrea told us that she used our soap boxes to create these adorable bridal shower gifts and that she really used loved how the Tropical Vacation Fragrance Oil stuck in her ITP (In-the-Pot) Swirl Soap. I totally agree with her, these little soap favors turned out so cute and show that you can do so much with just a little soap box. You might actually recognize Andrea from when she was on our BBAC Team from last year, and you can check out her super inspirational interview here. 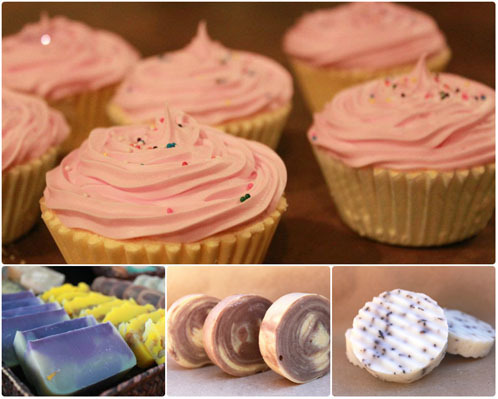 Thank you so much for being part of our amazing soapmaking community on Bramble Berry’s Facebook page, Andrea. Keep your eyes open for a special little package being sent your direction. Previous Post: Top of the Beer Soap To You! Next Post: #Baby Powder Winners! Beautiful boxes, they look so cute with the flower…pretty boxes and pretty soaps !!! I love those soap boxes! Aren’t they amazing? It goes to show you that with a little bit of creativity you can turn anything into something super cute! Andrea’s soap is gorgeous – I love the colors of the ITP swirl! And she did a fantastic job jazzing up the boxes. They will make adorable bridal shower favors! Congrats, Andrea!